There are a bunch of things I can't figure out how to do for Pokemon Bronze 2. I have tried simply commenting out the wild pokemon data, but that just rearranged everything. Even tried setting the encounter rate to 0. But still that gives the same result. Removing unused areas from the town map no matter what I tried building it would always give me a "missing whatever" or whatever. Everything else I have no idea where to even start. This is already done for Mahogany Mart while Team Rocket runs it. constants/music_constants.asm defines MUSIC_MAHOGANY_MART, and MahoganyMart uses that as its BGM in maps/map_headers.asm. Then home/map.asm:GetMapHeaderMusic checks for it and jumps to a special case for that value, which checks StatusFlags2 to decide whether to play MUSIC_ROCKET_HIDEOUT or MUSIC_CHERRYGROVE_CITY. Then you just define MUSIC_FOR_RAIDED_MAP and use it for all the relevant maps. Just remove the map from its particular region file in data/wild/*.asm: the first line with the map declaration, the second with the encounter probabilities, and the three groups of seven for mon/day/nite Pokémon. Move its encounter data from data/wild/kanto*.asm to data/wild/johto*.asm. Rearrange the location in constants/landmark_constants.asm, and change its coordinates in engine/landmarks.asm. Same as changing the map's location, just delete the landmark data instead of rearranging it. Two tips for finding the answers to these sort of questions. One, just browse through the pokecrystal files and get familiar with their names and what sort of data or code is inside them. You can ignore the low-level asm-heavy ones (which is most of home/ and some of engine/), but pay attention to ones with important names. Like, engine/npctrade.asm is probably going to have the NPC trade information. I commented out all the unused areas, but that just caused the town map to start displaying Kanto areas in Johto after I had scrolled through all the Johto ones. The constants/landmark_constants.asm values need to correspond to the landmark entries, line by line. Rearranging flight locations in pokegear.asm has completely messed up the fly map menu. 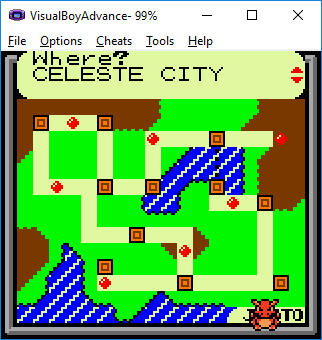 It shows Kanto locations in Johto, and in Kanto everything is just corrupted and I don't know how to fix it. And I'm still unable to remove unused locations from the map. It will not build the game when I remove them.